Last week was Thanksgiving. It's so weird how quickly time goes by. Every six weeks the students have a home visit, and we get a three day weekend. This happened to coincide with Thanksgiving (we're run by Canadians, so I'm fairly certain it wasn't planned that way). With the extra day off, a group of us decided to take two of the local teachers and visit some of the historic sights in Dhaka. We started at Lalbagh Fort in Old Dhaka. Built by the invading Mughal empire, it was a palace and walled fort for the visiting emperor. It had quite the extensive grounds that were very well taken care of. in the monsoon season and was used as a pool. The burial place of a Mughal queen and her children. Then we went to the Mother Tongue monument, which commemorates when the Bengali people (who at the time were still East Pakistan) fought to preserve the use of the Bangla language, instead of Urdu. There was a protest there, but as our local guides told us, people just hold them there so they can get press, nothing usually comes of it. We were going to go to the National Museum, but it was randomly closed. They aren't usually closed on Thursday, and it's not like they have an updated website with their hours listed. We took lunch at the Star Bakery, which was just a local joint. It was delicious, fresh naan off the grill. We then drove northwest to Savar (which is where the horrifying garment factory fire was earlier this week) where the National Liberation Monument is. We made a pit stop at a university on the way. It's home to 40,000 students and is a closed campus. Basically a whole city within its walls. I'm a huge fan of monumental statues. Seriously. And when we got to the national monument I promptly left my camera in the car. Stupid. This is representative of the seven hills in Bangladesh. I have yet to see any hills. We had a nice entourage following us around the entire time. It was rather disconcerting. I did buy a little squeaky dog from a vendor for 20 taka, totally worth it when you consider how much it annoyed everyone on the ride back (I'm a bit like a 3-year-old sometimes). All in all, it was an incredible day. I was really glad we had a couple of locals to guide us through and show us the real Bangladesh. one, to make the library more home-y and two, to give students the opportunity to make the library their own. Working with the art teacher we're taking on a couple of things. We started with rearranging the shelves. Instead of just rows of shelves, we arranged the non-fiction section to wrap around a reading area and the fiction section to be separate. We also put shelves around the story area, with browsables* on them. For example, newspapers, magazines and, eventually, comic books. The great thing is, this design was suggested by a couple of very ambitious students. We're talking students who took the whole first class to explain what they hoped for exactly. The next project was creating labels for the non-fiction shelves. We used PowerPoint to basically create collages, so that students understand what those darn Dewey Decimal numbers mean. I'm in the process of getting these printed off and laminated. While I'm working on labels, our art teacher is helping the other students paint a mural on the wall in the story area. It's a work in progress, but I'm excited for the students to take ownership of their library and contribute to it. This week, my students chose a book to read and will write a review of it next week (really, they'll just fill out a form, to help teach them the basics of the review process). Then, over the course of the next couple of months, we'll display those reviews on top of the book return with recommendations for similar books. It's starting to come together, at least on the physical side, now I just need to get the older students (the 3-6th grades are here at every break, especially the younger ones) in here and reading more than just comic books and short non-fictions about smoking (seriously, the most checked out book in the library). Best news this week, though, is that the temperature has dropped and it's now a nice 20 degrees Celsius every day. Perfect weather. *is not a word, but should be.Chrome wants me to replace it with brow sables, as if those are words that go together. Having never read (only listened to) anything by James Patterson, I had no idea what I was getting into when choosing this book. I really like the premise. Daniel X is an alien, his parents were killed by The Prayer when he was three years old. He escaped (because he can change shapes, he became a tick and got away) and has since been hunting all the aliens on the Earth's Most Wanted Alien list until he's ready to face The Prayer again. Daniel has many other special abilities, like being able to project things from his mind and they become real, or being able to shape change into anything (even an elephant). However, there were three major problems with the execution. First of all, why is there a new chapter every two pages? This has never made sense to me. Isn't a chapter supposed to be a whole chunk of story? Sure the book is almost 300 pages, but with half pages because of the chapter endings and headings I imagine it's really only about 200-250. It seems entirely unnecessary to have a chapter break in the middle of a character conversation. I understand, this is James Patterson's style. He even talks about it, briefly, in Time magazine, but it doesn't explain it, and it doesn't necessarily mean he uses it effectively. Second, it's one thing to kill a character in a YA novel, it's entirely another to have the main character shrink in size (i.e., a tick), enter a villain, and explode out of him from the inside. Seriously, this happened twice, once in the first 10 pages. I was thinking I could recommend this to Grade 6 and up (11+), but I really wonder if I would feel comfortable doing so. Yes, the violence is generally done in a joking manner, and is usually directed towards aliens who are dripping in some sort of slime, but it seems unnecessary and overdone. Third, if I can predict, in detail, what will happen to a character and am right about it, then you need to work on your plotting. Daniel meets a girl, of course she's the alien he's hunting. It was so transparent to me I almost skipped the intervening chapters (there were probably 30 of them) until he figured it out. Instead I got several more chapters of the lead character, who is supposed to be a genius, completely missing out on obvious details. Also, plot holes abound, such as when Daniel talks about having a crush on his friend that he projected from his imagination. Bottom line, a good premise that was somewhat disappointing. I think the best term I could use to describe my feelings for this book is that it is decidedly meh. It could be better, it could be worse, it's just right there in the middle. Daniel X is just your typical teenager, he has friends, he goes to school, he gets in arguments with his parents, and he gets annoyed by his little sister, except that these people are all physical manifestations that he creates with his mind. When he was just three years old, his parents were killed by alien outlaw The Prayer, and ever since, Daniel has been tracking down each alien on the Earth's Most Wanted Alien list they left behind. Ergent Seth is #6 on the list, but with his plans to rule the world, with a hint of child labor, he might be more than Daniel X is capable of handling. 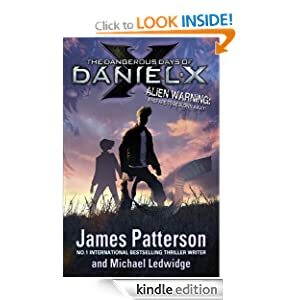 James Patterson, the much beloved author of the Adult Fiction series Alex Cross, makes his second foray into teen fiction with the Daniel X series. True to style, he keeps the tone light and quippy, with Daniel laughing off the danger he faces, and his imaginary best friends providing assorted comedic relief. While the premise is promising, the execution seems to lack. The plotting is fairly transparent, the character of Daniel X has no real depth, and the conclusion needed a bit more suspense to be effective. Overall, students 12+ might not notice the gaping plot holes, would definitely laugh at the teenage humor, and should enjoy the temporary diversion Dangerous Days of Daniel X provides. A professor once told me that I should read the first in the series and then move on, so that's what I'll do with this series, even if the subsequent books generally reviewed better than the debut. This week, I'm reading Call it Courage, by Armstrong Sperry. It's fairly short, which leaves lots of time to finish up A Feast for Crows (page 660 this morning!). Back to school, back to school... Being on vacation was addictive, isn't it always? I rolled out of bed (I slept in until 8:30 am!) this morning and my first thought was "only six weeks until Christmas break." It's odd, because I generally love my job. But I also like travelling, and I'm going to Australia for Christmas*, so it's something big to look forward to. Anyway. To the post title. Before I left on vacation, I got a delivery at the library that made me giggle like a little girl and get weird looks from the delivery man (the housekeeper who happens to bring delivers from the car, so someone I run into on a regular basis, yay). Something to giggle at like a little girl. More importantly, they are keeping the books upright, because the relative humidity in the library has yet to fall below 50%, the paperbacks tend to become pliable,the covers bend, and they become damaged. This week I'm rearranging the library, according to feedback from students. They're also working on making labels for the shelves. I've struggled because I really want to make labels (I can be crafty...ish), but decided that allowing the students to help decorate the library would help them take ownership of it. So, they're helping design it, making labels and signs, and painting a mural. As soon as we're done, I'll get some more pictures. I'm so proud of myself. I took 492 pictures in Nepal, at least 200 of which were of sunrises. *I may or may not be going there because then I can see Les Miserables and The Hobbit: An Unexpected Journey on the big screen. Also, because it's the land of Hugh Jackman, I might try to stalk him, we'll see. In short, I loved Nepal. We went to Kathmandu, switched hotels twice, had so much good, fresh food. Overall, best vacation to Nepal ever. I'm so excited to go back someday. This moment of zen brought to you by sunrises in Nepal. Anyway, I'm lazy and tired, so here is a link to the online album I made, I think it works.